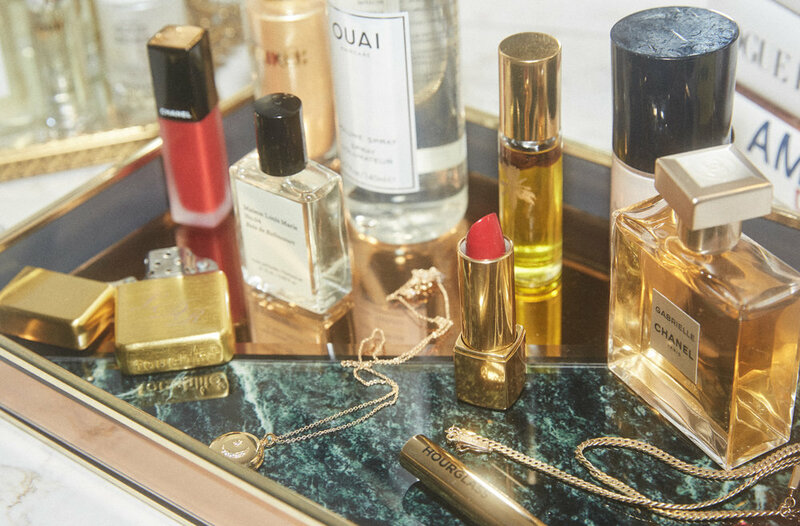 Welcome to my most cherished, and truly, the most glamorous and special corner of my home- the vanity. You most likely recognize details of this very corner from my flat-lays I share and it's safe to say that out of all the corners of my place, this is the one that I put the most effort in in terms of decorating and perfecting. Although I have one more spot in my bedroom where I do a majority of my day to day getting ready, I chose to make this vanity less about functionality and more about a spot of finishing touches like a lip shade and a spritz of hair product or scent, and of course keeping the prettiest products on display to keep me inspired. 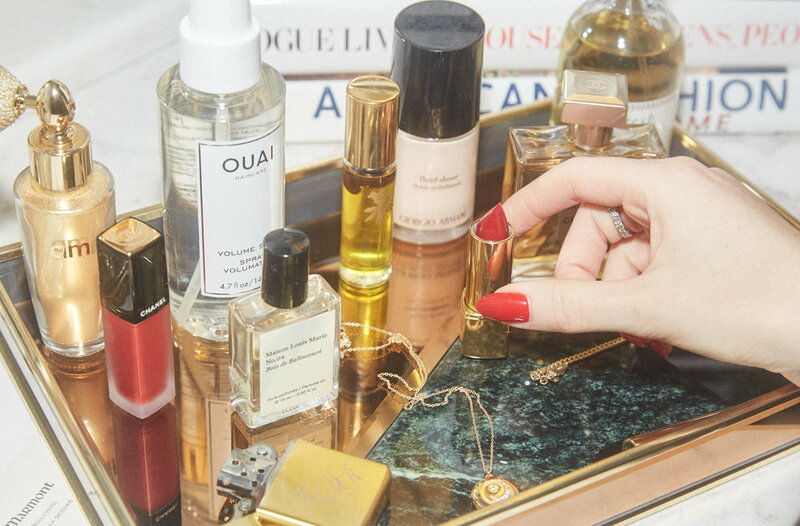 I like to swap out the items on display here from time to time to keep the space fresh and interactive when I'm experimenting with new beauty looks and products. And of course, I couldn't help but make it photogenic which outside of the pretty products, I must thank the decor from Vintage touches, to Target and West Elm. See below for all of the details. Featured products: (on me) Sugarpill cosmetics shadow in "home sweet home" via Beautylish, Mac Lip pencil in "stone" mixed with "edge to edge", BH cosmetics "spotlight" highlighter palette. Palm tree and cherry necklaces by Shami, (on trays) Ouai volume spray, Amika "show off" gold finishing dust, Chanel Rouge allure ink, Maison Louis Marie No. 04 perfume, RAAW by Trice "eye love" roller, Chanel Rouge Allure lipstick in #98, Gabrielle Chanel perfume, Fresh beauty fig apricot perfume, Locket by Sasha Samuel , Gucci embellished Brooch, Lana Del Rey Lighter, Armani Fluid sheer, Hourglass cosmetics "confession" ultra slim lipstick, Vintage basic chain necklace. Featured decor: Mirror from Target, Marble table from West elm, lamp from West Elm, Rose/green marble tray from Anthropologie. Gold Mirror tray is vintage.